Syncing files and directories between servers and local machines is a very common requirement when dealing with networked computers. One method of automatically syncing the contents of directories is with a technology called BitTorrent Sync. This software leverages the BitTorrent protocol that is commonly used for file sharing as a synchronization tool. Communication through BitTorrent Sync is encrypted end-to-end based on a unique shared secret that is auto-generated. While BitTorrent as a file sharing mechanism is a public service, the way that BitTorrent Sync uses the protocol is private, meaning that files can be transferred securely. In this guide, we will demonstrate how to install and use BitTorrent Sync on two Ubuntu 14.04 servers. We will show you how to set up your shared directories, and how to set up SSL encryption for the web interface to securely administer your servers. The first step that we need to get started is to install the BitTorrent Sync software on both of our server instances. Many of the procedures in this guide will be mirrored across both machines, so make sure you duplicate your commands for each machine. There is no official BitTorrent Sync package available in Ubuntu's default repositories. However, there is a well-maintained PPA (personal package archive) created by Leo Moll (known as tuxpoldo) that we can use to get up-to-date packages. You will be asked quite a few questions in prompts when you attempt to install. For now, press ENTER through all of the prompts. We will be reconfiguring our services momentarily in a more in-depth manner. Now that the software is installed, we're actually going to run the configuration script that prompts us for values a second time. This time, however, we will have access to additional options that we require for our purposes. This will run you through even more prompts than during the initial installation. For the most part, we will be going with the default values and you can just press ENTER. As you can see, for the vast majority of settings, we can accept the defaults. The above choices though are very important. If you mis-configure these, run the command again to correct your selections. Now, we have BitTorrent Sync set up for the most part. We will set up our sync directories in a bit. But for now, we need to set up our nginx web server with SSL. You may have noticed that we configured our web interface to only be available on the local loopback interface (127.0.0.1). This would normally mean that we would not have access to this when running BitTorrent Sync on a remote server. We restricted access like this because, although the BitTorrent Sync traffic itself is encrypted, the traffic to the web interface is transmitted in plain text. This could allow anyone watching traffic between our server and local computer to see any communication sent between our machines. We are going to set up nginx with SSL to proxy connections through SSL to our BitTorrent web interface. This will allow us to securely administer our BitTorrent Sync instance remotely. Again, we will need to do all of these steps on both of our hosts. In this field, enter your server's domain name or public IP address. Now, we can configure our nginx server blocks to use our SSL certificates when communicating with remote clients. It will then the information to our BitTorrent Sync web interface listening on the local interface. We will leave the default nginx server block file intact in case you need to use this in the future. Since BitTorrent Sync operates on port "8888" by default, we will use this as the front-end SSL port as well. Make sure you change the red text to your server's domain name or public IP address. This will tell nginx to bind to the same port that the BitTorrent Sync web interface is using on the local interface. The difference is that nginx will use the public address and require SSL. It will use the SSL certificate that we created to encrypt the traffic to the client. It will then pass it to the BitTorrent Sync interface. In this way, the traffic between the server and the client will be encrypted, but the BitTorrent Sync interface will operate as if we were accessing it from the server itself. Make sure you go through these procedures on each of your two servers. We now have BitTorrent Sync configured, and have set up SSL and nginx to encrypt our sessions with the web interface. Before we begin to use the web interface, we should set up the directories that we want to sync. Because of the way that BitTorrent Sync creates files that it has mirrored from a remote host, our configuration for this portion is pretty important. There are many different ways you can configure this access, each with implications. We are demonstrating a fairly flexible system here that will minimize the permissions and ownership conflicts. Now that we have everything set up, we can begin taking a look at the administrative web interface to pull the pieces together. This is only a warning telling you that your browser does not recognize the party that signed your SSL certificate. Since we generated self-signed SSL certificates, this makes perfect sense and is expected, and we can safely click "Proceed anyways" or whatever similar button your browser gives you. You will be prompted for the username and password that you selected while configuring BitTorrent Sync. In our example, the credentials were admin and password, but yours (especially the password) may be different. We can not begin to add the directory we configured to the web interface. You will be presented with a dialog box that gives you the secret for this directory. This is the way to sync this directory with another instance of BitTorrent Sync. The software allows you to set up full access to the directory (read and write access), or read-only access. For our guide, we will be configuring full access to allow two-way syncing, but this is simply a preference. You will need to copy the "Full access" secret from this interface to set up the syncing with your second server. Now that we have the first server configured to share its directory, we need to set up our second server. We will go through most of the same steps, with some slight variations. You will see the SSL warning again, and you will need to authenticate. You will come to the same empty interface that we saw before. Click on the "Add Folder" button, as we did before. 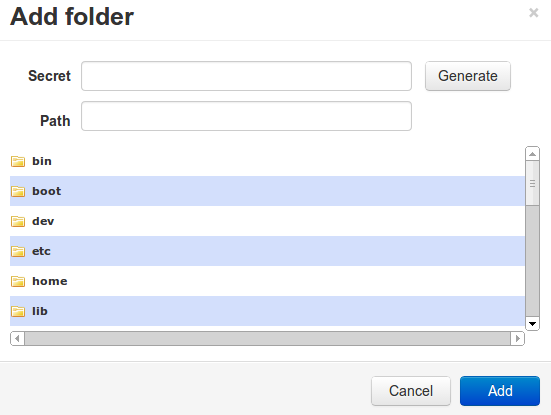 Select the /shared directory that we created. Click on the "Add" button in the lower right corner when you are finished. This means that your servers are communicating with each other and can sync content. Let's test our current setup. As you can see, our files were synced over. If you look at the web interface though, this sync has not registered. This is because these files don't contain any actual data. We will test whether it can detect when we transfer files with content by writing data to those files from our second server. This will also allow us to test that we can sync changes back to the first server. If this is working, you have successfully configured BitTorrent Sync to mirror your changes between servers. You should now have a flexible setup that allows you to securely transfer files between remote servers. Furthermore, this configuration allows you to administer the service through a secure connection by leveraging SSL. The application itself is quite flexible and can be used in a variety of ways. Some useful features are the ability to scan secrets as QR codes on your mobile device, the ability to configure read-only access to content, and the ability to provide clients with one-time use secrets. You can also configure your servers to only communicate with certain hosts. The BitTorrent Sync service also provides a simple version control system, which utilizes a hidden ./SyncArchive directory in shared directory to keep old versions of files. You can also implement restrictions like rate limiting if you want to make sure that your files are synced without affecting other services.